This triangular site, at the intersection of Cooper Avenue, Cypress Hills Street, and 65th Place, was named for John Wesley Drumm (1862-1930) on April 19, 1932 by the Board of Aldermen. 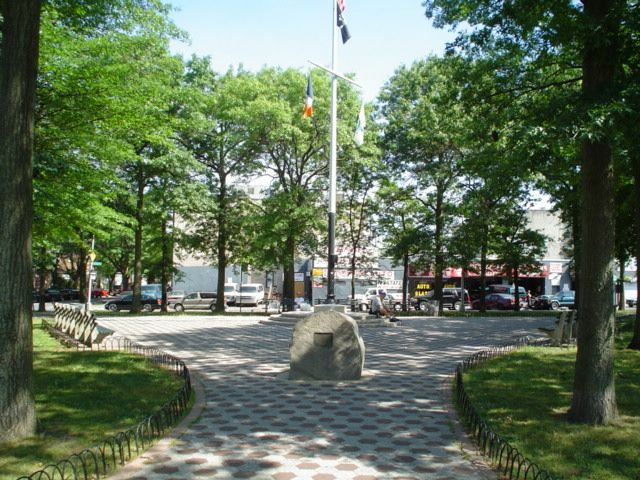 Drumm was a pioneering Queens educator who broadened the knowledge and horizons of generations of neighborhood children. His 37-year career as a principal in Queens public schools began in 1893 at the Glendale Union Free School #13, located in what was then part of Newtown. After the five boroughs of New York City were incorporated in 1898, the school was renamed Public School 67 with Drumm remaining as its principal until 1915. From 1915 to 1929 Drumm presided over Public School 91 on Central Avenue and 69th Street. Drumm passed away on June 8, 1930, at the close of his first year as principal of Public School 119. On May 21, 1932 this site, which is located near his home on Cypress Hills Street, was dedicated in his honor. The memorial plaque set on a boulder was donated by the Alumni Association of P.S. 91. This site was acquired by Parks on February 4, 1926. It was restored under a $204,000 capital project funded by Councilmember Ognibene in 1997. The renovation transformed Drumm Triangle into a sanctuary for Glendale residents with new shrubs and groundcover, decorative pavement, and World’s Fair benches.